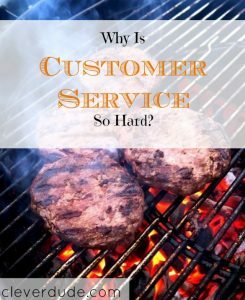 My New Grill, and Why Is Customer Service So Hard? I recently wrote a post diving into the question, â€œIs the customer always right?â€ Many of the comments revolved around how businesses will generally do what it takes (within reason) to make the customer happy with hopes of gaining returning business. I experienced the exact opposite over the weekend. Smattered with rust, and the adjustable coal rack warped and tilted, my charcoal grill is at the end of itâ€™s life. I decided to live with it for the winter, but had my heart set on purchasing a new one this spring. After months of research and contemplating, I knew exactly which one I wanted to buy. I walked into an ACE hardware store ready to buy the Weber Performer Gold. While there, I noted they also had a 22 inch ring with a rotisserie attachment on display. 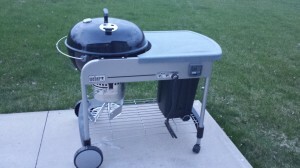 I lifted the lid off of the Performer, and set the rotisserie assembly on the grill to see if it was the right size. As it slid perfectly into place, I knew it was coming home with me as well. The next day I was giddy with excitement as I readied a whole chicken for my first home rotisserie experience. Seasoned, and placed on the spit, I flipped the switch on the unit. Nothing happened. My rotisserie did not function at all. I could hear the motor humming, but it would not turn. The next day I brought the whole unit back to the store. After plugging it in to ensure it didnâ€™t work, and checking their inventory the employee informed me that they didnâ€™t have another one in stock. They called another nearby location, and despite the computer inventory system saying they had one, they claimed they could not find it. At this point I made a suggestion. They sold the rotisserie attachment separately without the ring. All they had to do was remove the rotisserie from the ring, and give me a new rotisserie unit. He looked at me and stated, â€œOh, we can replace the whole thing for you!â€ He then suggested calling his Weber representative for suggestions on how they could help me out. The Weber representative didnâ€™t answer her phone, voice mail left instead. He said he could order me a new one, and it would likely arrive on Wednesday or Thursday. He asked if that would be sufficient, or if I needed one that day. I explained that I had a chicken seasoned and ready to go, and AGAIN asked if they could just give me one of the separate Weber rotisseries that I cold plainly see that they had in stock on the shelves. Again, my suggestion didnâ€™t seem to register. The employee asked for my name and number and said he would call me back later that day. When he called he simply stated that his Weber representative was sending a new rotisserie attachment and it would be in on Wednesday. It all seemed so pointless. Half a dozen of the very part they were shipping to the store are currently sitting on a shelf in the grilling isle. So much for doing everything possible to keep the customer happy. Have you ever been frustrated by a business not taking an obvious action to rectify a situation? What did you do? My experience with the customer is always right syndrum has been in food service. I could never understand, initially why it was acceptable to refund a dinner or exchange it without charge, for someone who didn’t like the meal they ordered. Often it was a matter of them not reading the menu or just not liking the item. I compared it to watching a movie at the theater and then asking for a refund or going to a theme park, riding a few rides and then asking for a refund. As backwards as the practice sounds, it kept people happy and coming back. Lost money initially came back as repeat customers. The assumption is if people are catered to, they will feel a loyalty to a brand. That’s so frustrating. The solution was obvious. I have definitely had bad customer service situations it seems like everywhere; there are a few places that have great customer service, but unfortunately I can’t say I’m loyal to the brand.. I don’t believe in brand loyalty. @Cathie – wow, that’s messed up that you couldn’t figure out a way to fix a product….very bad business model. In my case it was SO frustrating, it would have literally taken me less than 5 minutes to remove the old unit from the ring and attach a new one out of the box! @Scott – I like your comparison, “Loyalty to a brand.” I think it also comes down to being made special….if a business makes a customer feel special, then they’re likely to form a bond and return. Everyone likes to feel special!